Our Lux series, offers both soft rubber wheels for hardwood floors and a stylish polyurethane wheel which can be used on either hardwood floors or carpeting. The soft rubber wheel is available in both 2" and 3" diameters. Although we do not recommend any caster for a SOFT WOOD floor such as Pine, this Lux series with it's extra soft rubber wheels has been used successfully on SOFT WOOD floors. All wheels are non-marking, non-streaking, heat treated raceways, and sealed precision bearings for the highest quality chair casters in the industry. 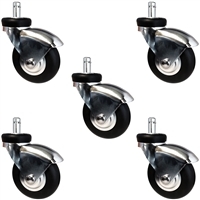 Caster Barns 3" Chair Casters are the highest quality chair casters in the industry! Our quality is guaranteed to last!